Work with EYE CATCHING MEDIA to promote your business all around town on a mobile billboard truck. In July 2002, Outdoor Advertising Magazine reported that "studies conducted by the Transportation Council of America (TCA) show that mobile billboards have an impressive 97% recall rate, virtually unheard of with most advertising mediums." The magazine also mentioned that "there is a greater need by advertisers to more accurately target a message to an increasingly mobile demographic target." 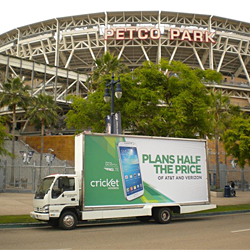 Here at EYE CATCHING MEDIA, our mobile billboards in Los Angeles and other major cities are the ideal way for you to deliver your message to potential customers at any location during the day or in the evening. You can even get a specific advertisement seen in a high-traffic area on short notice with mobile advertising. Whether you want to promote your event, new product, or a service, you can have a significant presence at sporting events, conventions, and around town during a month of your choice. Flexibility—We have no boundaries—get your message in front of your target audience anywhere at any time. Whether you need us for a special one-day event, such as a movie premiere, or for a month-long branding campaign, we're here for you. GPS Tracking—We track truck routes 24/7 and provide proof-of-performance GPS reports on completed campaigns. Our drivers fill out their log sheets hourly, and you get color photographs of your on-location advertising. Product Sampling—Let our professional, uniformed drivers pass out samples of your product at a specified location. 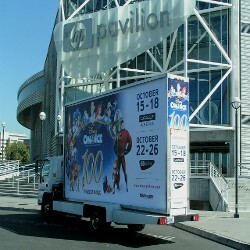 You can advertise at sporting events, concerts, universities, and convention centers. Sound System & Lighting—Our trucks have state-of-the-art sound systems to create the right mood with music and draw an even larger crowd. Your campaign gets attention, and having upbeat music complements your product sampling efforts. Our lighting also provides added appeal during the evening hours. Our full-size billboards are easily seen in traffic, and you can choose the places where your ad will be displayed. 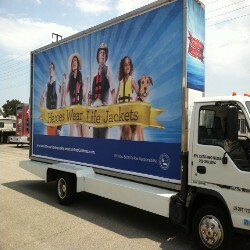 Visibility & Impact—Your mobile billboard ad can be seen from up to half a mile away. Precision Targeting—You choose the routes you want to be covered, and you specify the customers you want to target. We drive your billboard ad throughout your targeted area eight hours per day. Performance Tracking—Calls generated by your mobile billboard can be tracked with toll-free numbers. You can also inspect our driver logs and GPS tracking reports. Flexibility—Your message can be changed easily and quickly at minimal cost. Cost Efficient—Compare the cost of mobile billboard advertising to other advertising mediums. You'll notice that mobile billboards have the lowest CPM (cost per thousand impressions). Discuss your advertising campaign ideas for mobile billboard advertising in Sacramento, CA, and the surrounding areas with us by calling (253) 218-3179 today.